Deer Shed Festival is back for its 9th year, from Friday 20th - Sunday 22nd July at Baldersby Park, Topcliffe, North Yorkshire. This year's festival will be showcasing its biggest ever programme of music, arts and science. 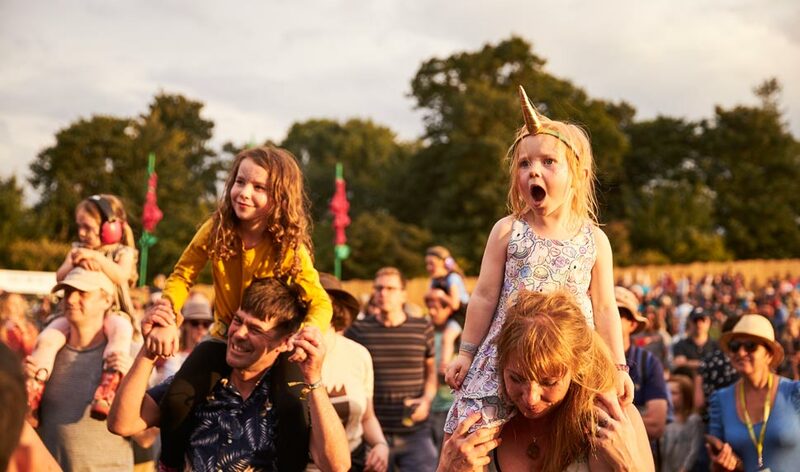 Deer Shed Festival 9 boast an impressive line-up of indie, electronica, rock and folk, with headlines from Goldfrapp, Drenge and Field Music (with the Opera Here Orchestra), ensuring there is something for everyone. 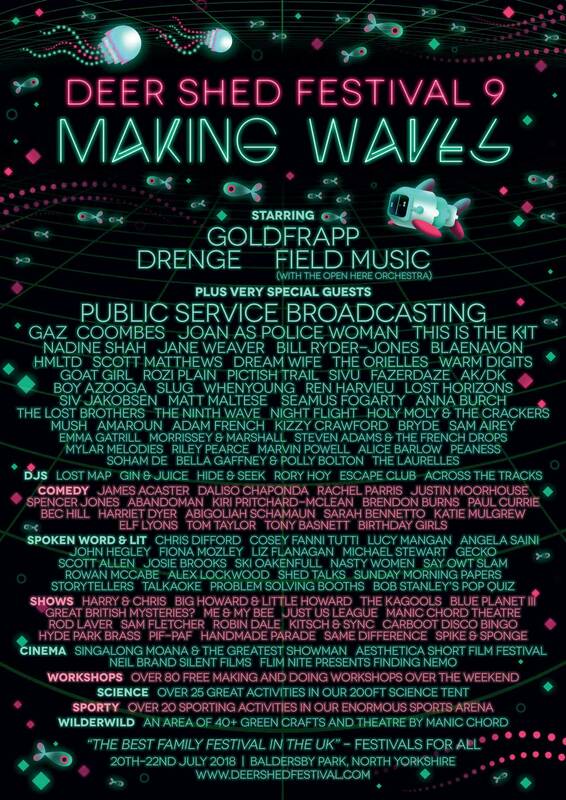 Public Service Broadcasting, who performed in 2013, return as special guests, they are joined by Gaz Combes, Joan as Police Women, This Is The Kit, Nadine Shah, Jane Weaver and Bill Ryder Jones. As with previous years Deer Shed Festival prides itself in featuring new and emerging music, this years big tips are The Orielles, Dream Wife, Goat Girl, HMLTD, whenyoung, Blaenavon, Matt Maltese, Mush and Amaroun, among many others. Deer Shed Festivals knows that to keep the whole family happy there needs to be more than just great music and there is no shortage of other things to see and do. For comedy lovers, this year features household names James Acaster, Rachel Parris and Daliso Chaponda headline the Big Top comedy club, with Justin Moorhouse, Spencer Jones, Abandoman and Kiri Pritchard-McLean joining them. As with previous years there is no shortage of Theatre and Spoken Work. This year sees spoken-word sensations Harry and Chris performing their unique mix of comedy, melody and poetry. They are joined by the always fantastic Big Howard and Little Howard, and The Kagools. New this year is The Buckends stage that will host authors, poets, storytellers, philosophers, activists and musicians. Chris Difford from the band Squeeze will be talking about his recent memoir Some Fantastic Place. This year also saw Deer Shed Festival has moved into producing their own theatre. Along with Leeds-Based Manic Based Theatre they have commissioned an immersive theatre experience in the sites woodland belt, also know at The Wilderwild. The show called Our Time, will feature Lewis Carroll inspired characters of time, who embark on an interactive journey alongside Deer Shedders to save Father Time. As always there are extensive activities for kids (and grown-ups) of all ages with the arts and science tents and the sports area. And If that’s now enough this year also features workshops from The Royal Company, Northern Ballet, 201 Dance Company and York Theatre Royal. With the support and guidance of WasteAid UK – the official charity partner of Deer Shed Festival 9 – Deer Shed is getting #DrasticOnPlastic by banning the sale of single-use plastic bottles and straws for 2018, heavily investing in further recycling infrastructure, and pledging to become completely single-use plastic free festival by 2021. See our review of Deer Shed Festival 2017.